The generosity of a Pasadena family and its lasting impact on Japanese Americans. California history has two faces. The racism that put Japanese Americans behind barbed wire in World War II and segregated African Americans, Jews, and Latinos for decades seems unbelievable. But the determination of people like the Carrs to do the right thing in spite of public opinion inspires faith in the American system. In 1944, William C. Carr became the president of Friends of the American Way in Pasadena. It was an organization determined to help Japanese Americans who had unjustly been imprisoned by Executive Order 9066. There had been a significant Japanese American population in Pasadena before neighbors and friends watched the government send them to camps. 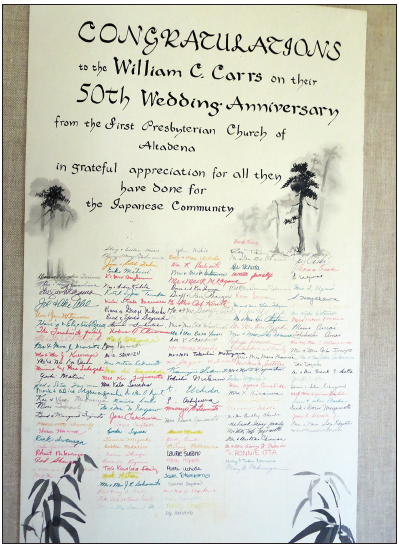 Japanese Americans signed a thank-you card to William Carr in appreciation for the family’s kindness. During the war, the Carrs brought care packages to Gila River and managed properties for families forced to leave due to the incarceration. John continues, “My father and his friend, Hugh, would pool their gas rations and figure out ways to go to the desert.” They would bring care packages and personal items to the Japanese Americans in Gila River camp. William C. Carr, a real estate agent, also saved many Japanese American homes by managing their properties as rentals. Carr, Hugh Anderson, and others went one more step and worked together to bring Esther Takei back to Pasadena Junior College as a test case in September 1944. Carr wrote many letters to public officials and **The Los Angeles Times** in support of democracy for Japanese Americans; his papers are with UCLA Special Collections. William Carr had a hardware store on North Figueroa, but he became fascinated with the Poppy Peak hill behind the business. Carr bought the hill, built his home with a beautiful view, and went into the real estate business. During the war years, his older son, William, was enlisted in the U.S. Army Air Force and his younger son, John, was in the Navy. Professor Joan Takayama-Ogawa said, “After the war, Mr. Carr decides that my parents, Hideo and Sonoko Takayama, would be the ideal couple to break the color line in the exclusive neighborhood of the San Rafael hills.” Carr sold a home on Brixton Road to the Takayamas and to Harry and Rei Osaki near 1956. The City of Pasadena also recognized John Carr’s leadership in the 1980s. Later, John Carr was in the leadership of the Pasadena Realtors’ Board. Susie H. Ling is associate professor of history and Asian American studies at Pasadena City College. If you posted a comment over the weekend, please repost. Some messages in the spam folder were accidentally deleted before they could be checked. What a lovely family photo of a wonderful family! 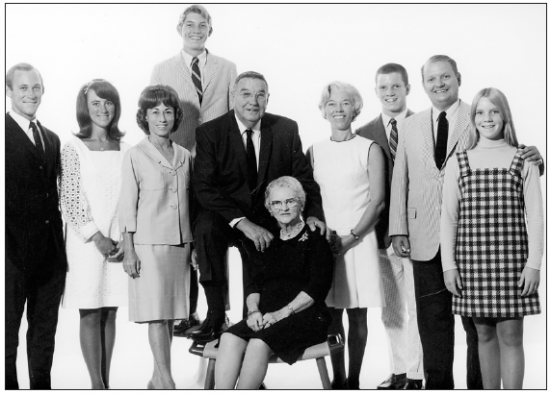 I am so pleased to have known Ginny and John Carr many years ago when, of course, I had no idea of the family history. It is decent people like this family that keeps the Human Race going against the odds in a generally very thoughtless selfish and violent world! I already left a meesage to congratulate this wonderful Carr family. There should be amny more such decent people who keep the Human Race going in the fcae of thoughtless greed and selfish violence – without such families I fear for the Human Race. “…to do the right thing…” Simple, yet powerful and reassuring that human decency exists and prevails. May this message rapidly gain momentum andcontinue to spread.